HP 6910p CTO T7300 14,1'' WXGA 2GB 120GB WL BT X3100 XP-Prof 3J.Gar. Thinkpad T61 CTO 15,4" WXGA T7300 1GB 100GB X3100 6c XP 3J.G. 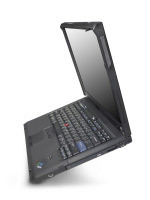 Thinkpad T61 UI0A9GE 14,1" SXGA+ 4:3 T8300-2,4 2GB 160GB NVS140M agn 6c VistaBus. 3J.Gar. Thinkpad T61 CTO 14" wide WXGA T7500 2GB 120GB NVS140 abgn BT XP 3J.G. Thinkpad T61 UI02BGE 14" SXGA+ T7300-2,0 2GB 120GB DVDRW FP VistaBus. 6c. 3J.Gar.